- listening to: Candi Staton "I'm Just a Prisoner (Of Your Good Lovin')"
I thought I'd give the whole high-waisted-pleated-pants thing a go. It wasn't too bad! They were actually quite comfortable. Since it was something I wasn't sure about, I went the cheapo route and bought a pair at the thrift store. I just cut them off a bit at the bottom and ironed a cuff into the bottom. Someone commented the other day that my beret is back. The cooler weather we've been having certainly warrants wearing a hat, but truth be told it's less of a fashion accessory these days as it is a clever way of covering up all of my roots that are growing in. The hair growing out process is in full swing and I'm still not sure how I feel about it. I know I'm going to let the bangs grow out but I'll have to see how I feel about the color (I think it's going to be a dark blond - we'll see!). I haven't dyed it in months and it's turned sort of an orangy shade. And yes, I know it matches my shoes. Completely unintentionally! Here's a look at all of the pieces I added to the Etsy shop today. Thanks so much for stopping by! If you had a chance to support two very lovely ladies trying to start their own vintage inspired line of lingerie wouldn't you jump at the chance? Especially when their photos are as wonderful as these? Hannah and Elvia are doing just that and funding their adventures through Kickstarter. I'd never heard of Kickstarter before this but I think it's a really wonderful program. Here's how it works... if you're trying to fund a project, you set a goal and a deadline. Then people are able to give as little or as much as they like to help you reach your goal. If you receive all of your funds by the deadline, great! If not, all of the money is returned. Easy-peasy. Go here if you'd like to learn more and help out The Loved One. They'll even send you a little present for your donation! Here are the first few pieces of the fall collection I've been working on. All of these are available in the Etsy shop now. Many more to come! - listening to: Danzig - Lucifuge "Her Black Wings"
As always, the blogging world is a-twitter about the weather. I've heard lots of complaints about the grey, hazy days we've been having in the northeast but they've been some of my favorites! This is the first day in ages that I've been able to break out a wool skirt and feel comfortable. 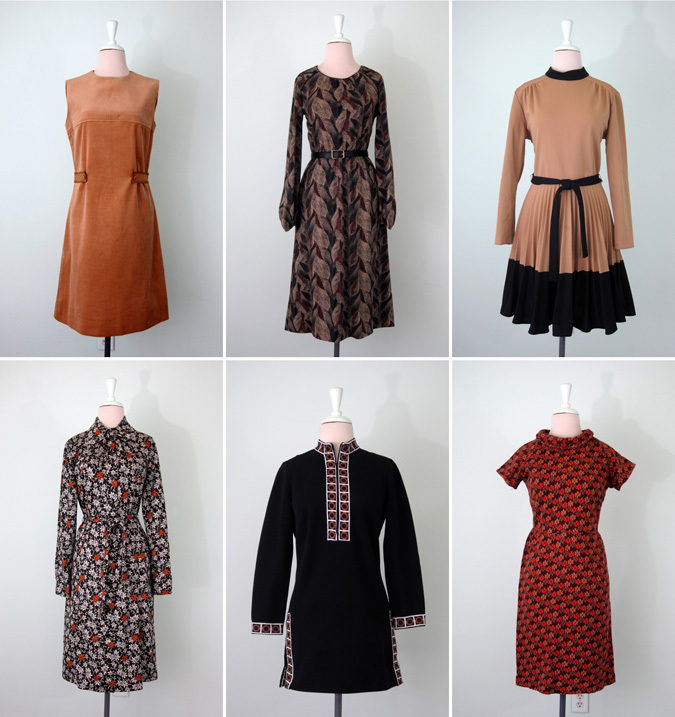 I spent part of the weekend going through all of the fall and winter clothes I had stored in the attic for the shop and spent today taking photos for the shop. Lots of good stuff coming in the next few weeks! photos: All The Pretty Birds, Stockholm Street Style, ??? The last few days have been filled with visitors from the south. We've been watching lots of old movies, baking peach cobblers and exploring the farmer's market. Lately I haven't been too into taking photos so I don't have any to share with you. Instead, I gathered together a few of my favorite recent street style photos. I'm drawn to the two photos on top for the colors as much as I am the actually pieces. The blush pink paired with black is one of my favorite combos. I'd also like to try the button-the-blouse-all-the-way-to-the-top thing but I'm a little weird about things touching my neck. I have intentions of paying homage to that third outfit with a little lace mini dress that's hanging in my closet and my Jeffrey Campbell sandals. I can't quite put my finger on what I like about that last photo. I think the girls are super adorable with their pageboy haircuts and 20s-esque shoes. I think it's more the spirit of the outfits than the actual clothes that I love. I've been extra good lately about putting things in the Etsy shop rather than in my closet but there are a few pieces I snagged for myself with cooler weather in mind. That first dress in a 70s era Lanz one that was big and poofy but I really like the bandanna sort of print and thought it could be reworked into something I liked. It took a day's worth of sewing and seam ripping but I finally got the hem shortened, the sleeves de-poofed and made a belt out of the leftover fabric. Now I can't wait to wear it with boots and a beret. I think one thing that makes me like fall/winter clothes the most is the fabrics. Corduroy! Tweed! Wool! 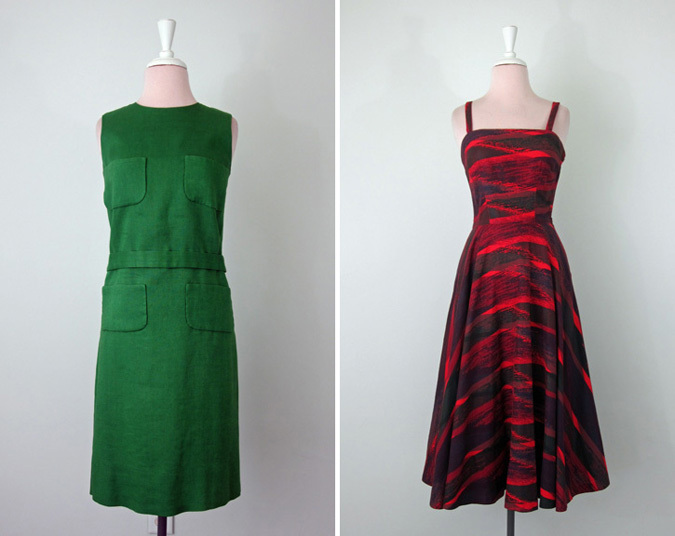 The next two dresses are wonderful examples. The corduroy jumper is actually an Etsy find I've been holding onto waiting for cooler weather (the pockets are the best!) 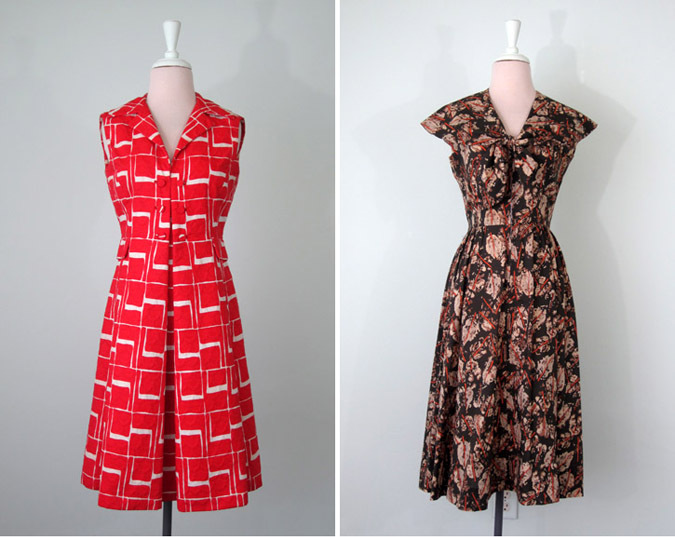 and the 60s tweed plaid shift dress is a thrift find (also with lovely pockets!). 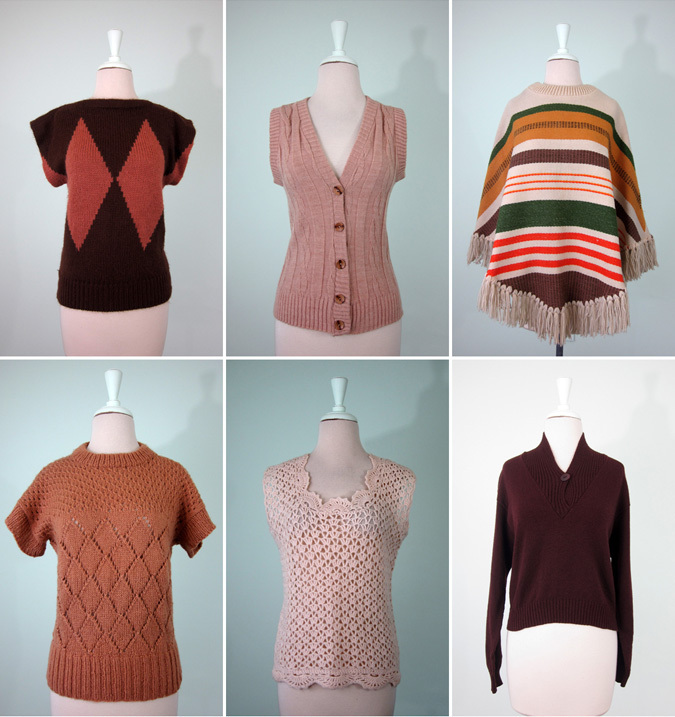 The sweater is the sort of thing I always find and end up selling in the shop so I never have one for myself. I fell in love with the colors of this one so I'm sure I'll be snuggling up in it quite a bit this winter. Also on the fall wishlist are carpet bags. I thrifted these two recently and will be keeping them for myself for a bit until they (maybe) end up in the shop. The tote bag is perfect for fall trips to the farmer's market. The other bag has a fun story behind it and I have to send out a big thank you to Lauren for so generously letting me keep it. One day a couple of weeks ago I stopped by a local thrift store while running some errands. I'd only been in it for a few minutes when a gal approached me and asked if I ran a blog... I said yes and she let me know she was a reader that lived in the area. It was the first time I'd been "spotted" in public so, Lauren, I hope I wasn't too awkward! She was sweet as pie and we chatted about the blog, our favorite thrifting spots, the best place to get Thai food in Lancaster and, of course, the weather. She had just picked up that lovely carpet bag and said it reminded her of me and wanted to know if I'd like to have it. Of course! Thanks so much Lauren! Here's your first look at the cinnamon hued Etsy shop update I've got in the works. 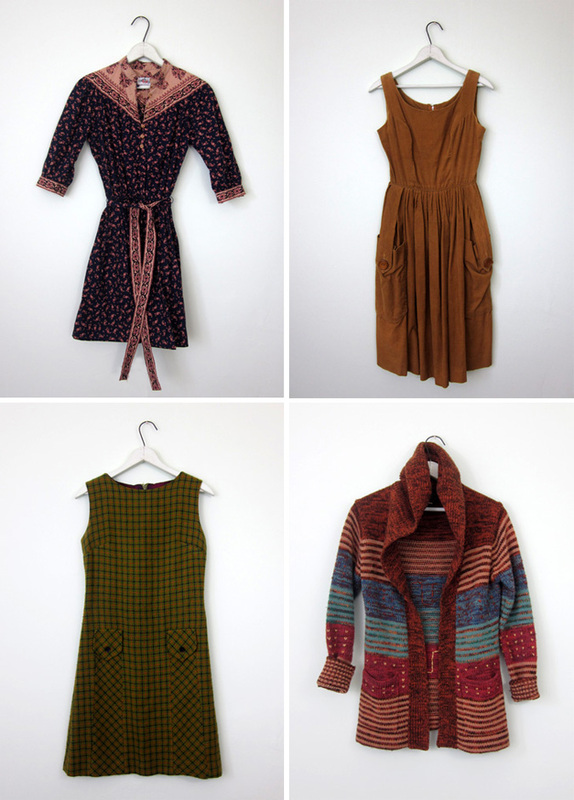 I think autumn is beginning to take hold around here (at least I hope it's around to last) and I'm really ready to start adding wool dress and sweaters to the shop. I'll hold off just a little bit longer, I think. - listening to: The National - High Violet "Lemonworld"
I wasn't sure I was happy with how these photos turned out when I first looked at them. They're a bit grainy and hazy but honestly, that's just what kind of day it was. There was a light mist falling the whole time I was taking these and by the end I was all damp. After all the hot days we've been having I didn't mind at all! It feel like forever since I've updated the shop! I've been working all day on taking photos and have the first batch almost ready. I thought I'd give you a little sneak peek at what I'm working on. All of these items will be in the Etsy shop tonight. 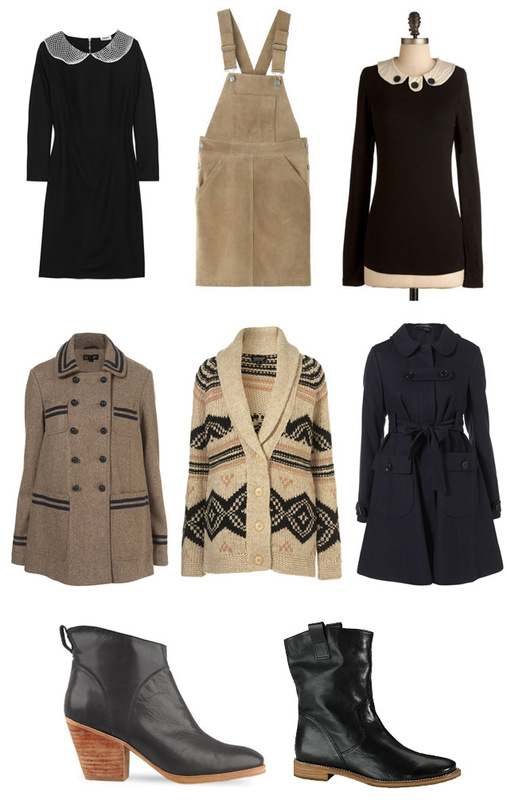 With the debut of the Built By Wendy Fall 2010 Collection, I think my fall inspiration folder is complete. 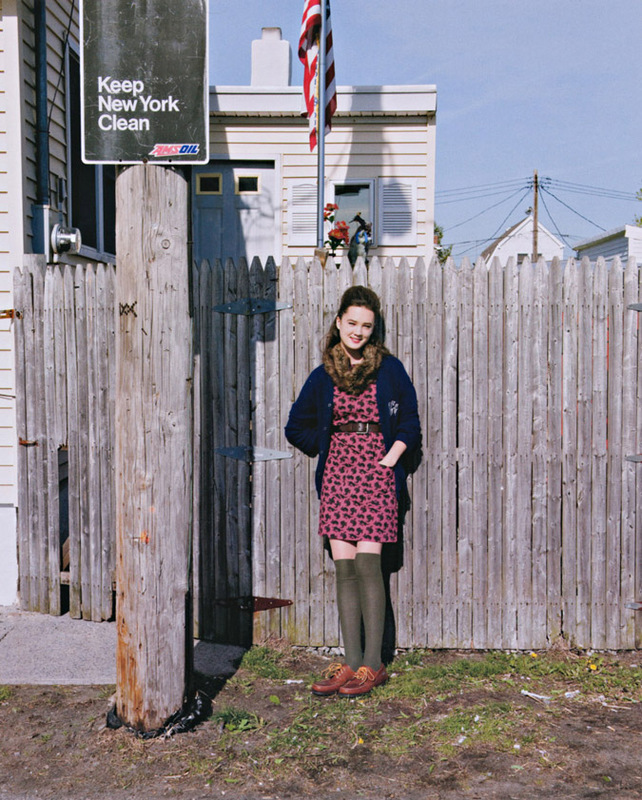 I like the muted color palette and the slightly 70s vibe of the jumper dresses and boots. 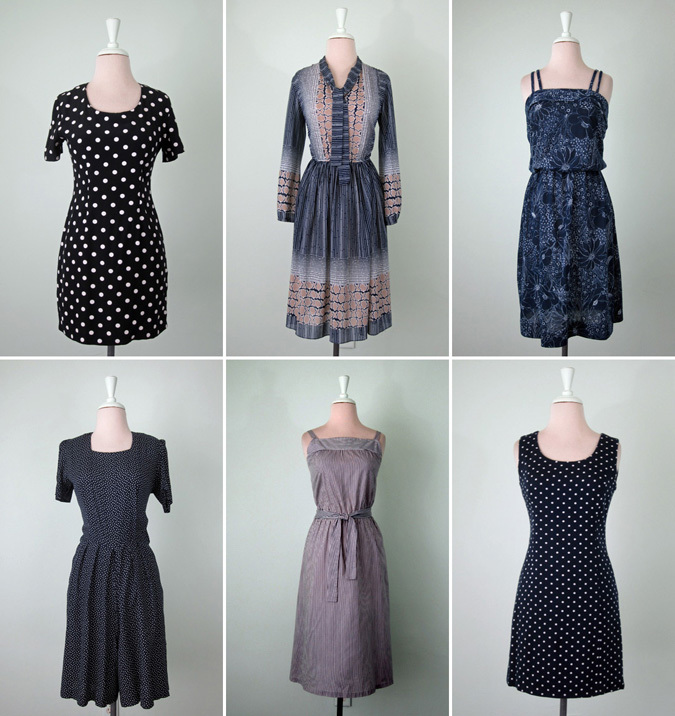 The first dress below is a favorite; I'm always a fan of stripes and pockets on a dress. I'm not sure about the velvet(?) 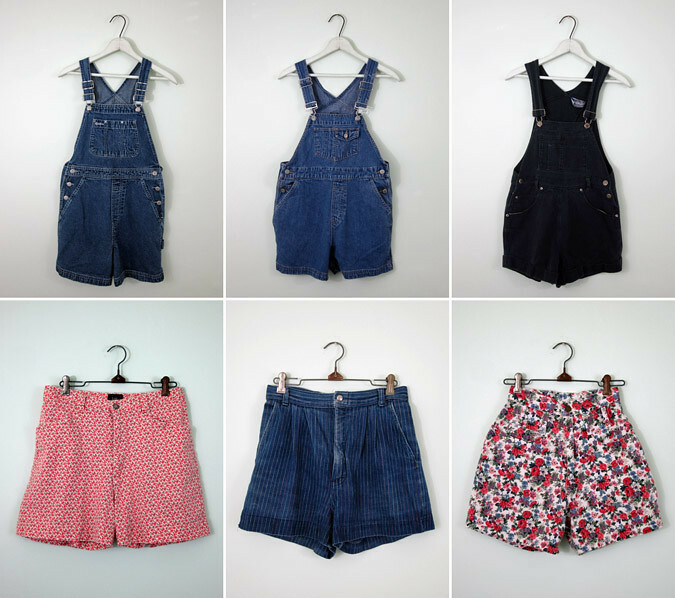 overalls but they strike me as one of those things that could really grow on me. 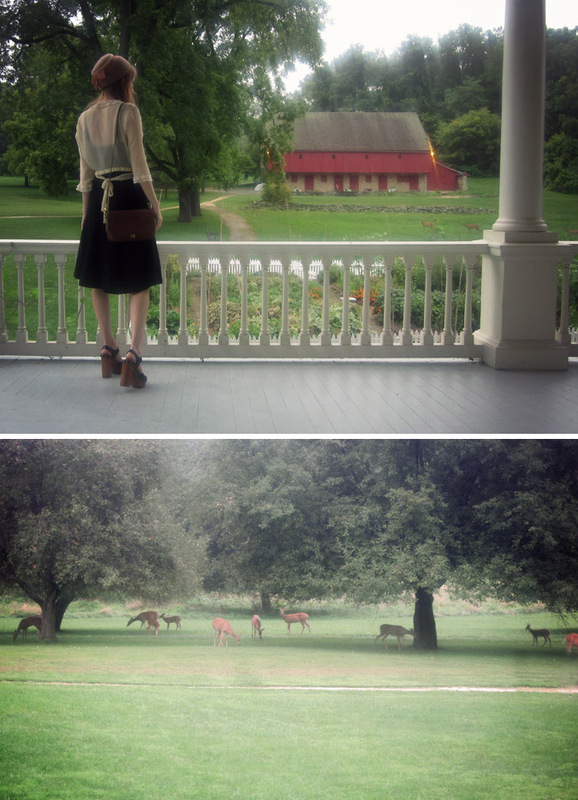 - listening to: Feist - The Reminder "I Feel It All"
Yesterday I stopped by Rock Ford Plantation to take a few photos for the blog. Since it was a Sunday evening I knew it would mostly be abandoned since all the guided tours stop earlier in the day. Well, all the people were long gone but I wouldn't really say it was abandoned! I was treated to quite a show as the does and their fawns wandered down from the hill to feast on the ripening apples hanging from the branches in the small orchard that sits on the property. If you look super close you may be able to spot a couple under the trees in the shot above. I hung out with the resident house cat on the porch for a bit while more and more ran across the field and gathered under the trees. At one point I counted 15 in all... 12 does and 3 fawns. My photos certainly don't do these graceful creatures any justice! As for the outfit, this lovely blouse is my latest acquisition from Francesca's shop . I literally gasped out loud when I tried it on. It's that wonderful. My only regret is that it's so delicate I can't wear it every single day without risking its ultimate demise. Oh, and the shoes! I finally got my hands on a pair of Jeffrey Campbell Splendids. I don't normally wear heels this high, but I have to say I feel like these make every outfit about a hundred times better. Expect to see them bunches... especially once I can wear them with thick tights this fall. If things have seemed a wee bit on the quiet side around these parts for the past week, there’s a good reason for it. Tom and I spent the better part of the week on a road trip to Massachusetts and hanging out with good friends around the Boston area. Usually I’m so excited about our upcoming trips I can’t help but blab about it all over the blog, but after reading about a couple that tweeted about a vacation only to have their house broken into while they were away, I decided that mums the word from now on while we’re traveling. Thus, you’ll be learning about our adventures in hindsight from here on out. Not that there’s too much to learn about this trip… it was all hanging out by the pool, eating tons of amazing veggie food, playing with adorable pets and just general relaxing. We also gave the camera a bit of a rest. The only photos we came home with were ones of Potato and Raisin, our friends’ pugs! 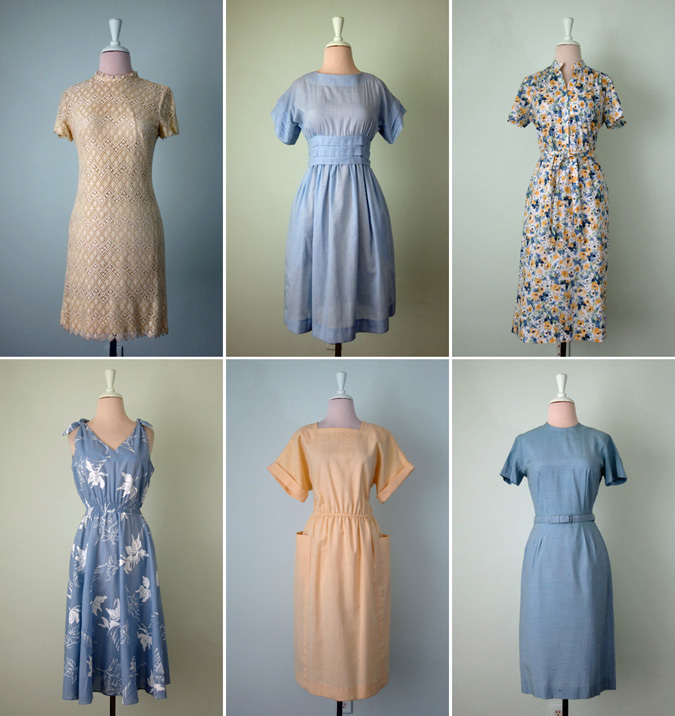 We’re home now and things will be getting back to normal with lots of shop updates and some outfit photos now that we’re getting a little hint of fall in the air. In other news, a little birdie told me that one of my (and probably yours) favorite collections will soon be available at Urban Outfitters as of the 20th; Madras by A.P.C. I’m pretty excited about seeing exactly what pieces will be carried. You may remember a while back I did a post about Venetia Scott and said I had some other editorials she styled that I wanted to share with you. Well, I'm finally getting around to doing just that. 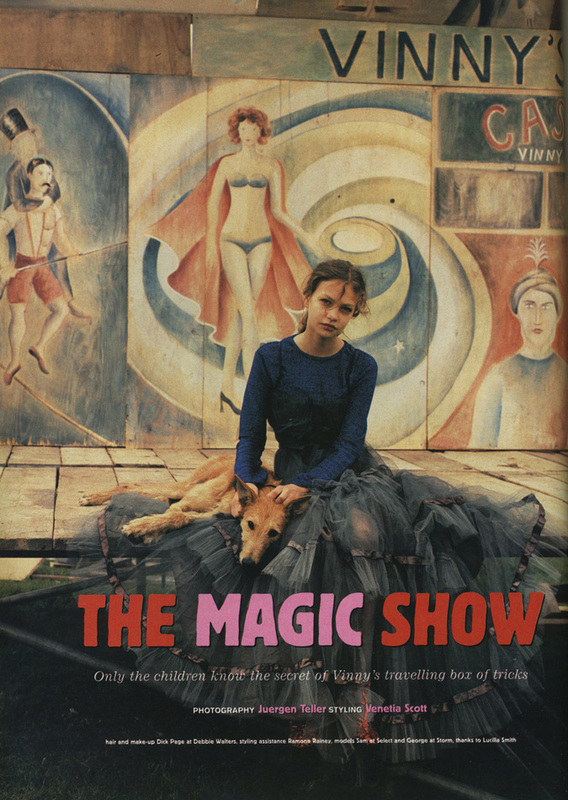 This is one of my favorites, called The Magic Show which was photographed by Juergen Teller and appeared in The Face magazine. It reminds me a little bit of these behind the scenes carnival photos! - listening to: The Runaways - "You Drive Me Wild"
We always intend to take photos when we go out of First Friday but somehow I never end up taking the camera out of my purse. I guess we're just too busy actually being there to stop and take photos. Some day I'll remember! 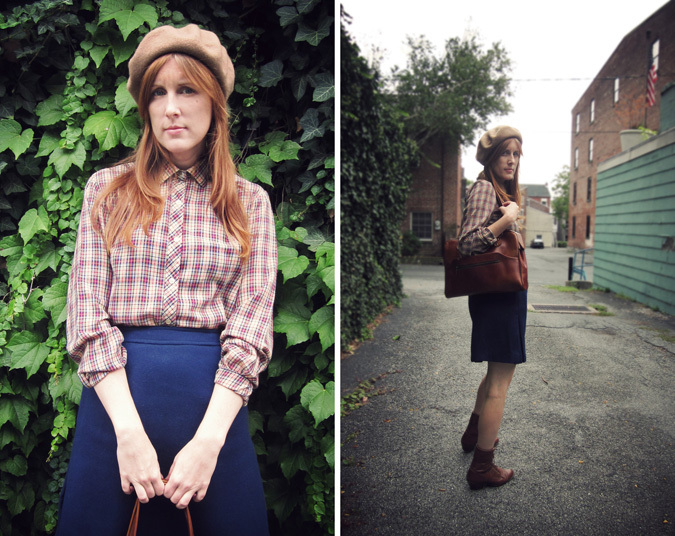 So, instead I recreated the outfit when we went for a walk around town Saturday afternoon. Oh, by the way... I added these pieces to the Etsy shop the other day and forgot to tell you! 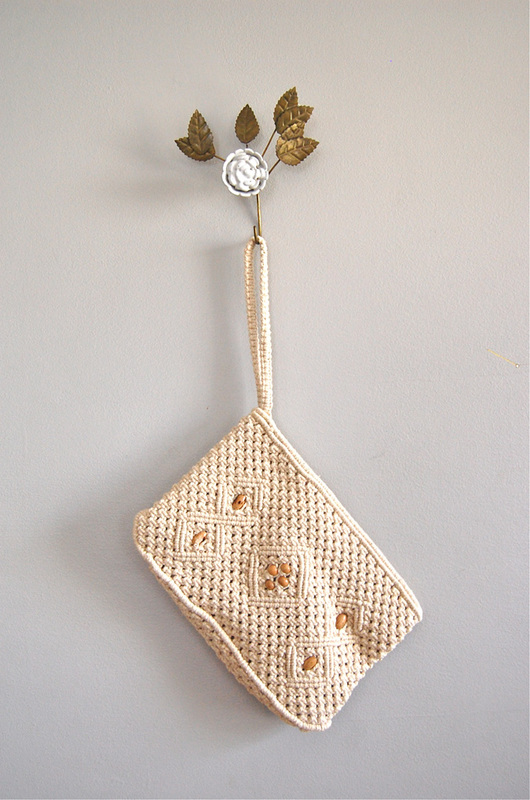 This week I'm so excited to bring you another giveaway from one of my most favorite Etsy shops. Dear Golden Vintage is the crème de la crème of the Etsy world in my book. Her finds really blow my mind. Lauren seems to live in a magical place where 30s dresses and gorgeous blouses lurk around every corner. If we were all so lucky! 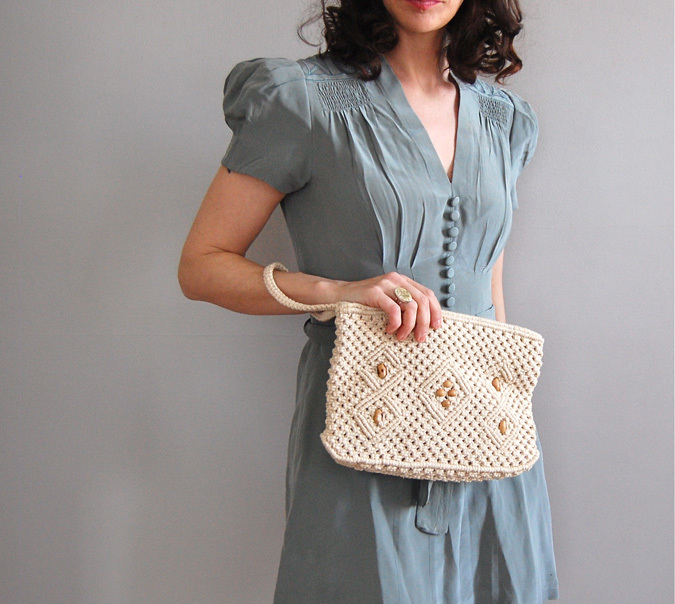 Well, one of can be so lucky as to have this lovely 70s macrame purse right out of Lauren's shop. It's not an enviable task, having to pick one favorite item from her shop but that's the assignment to enter the giveaway. Just leave a comment on this post and in a week, I'll pick a winner. Good luck! The cicadas here are in full swing and every night we are treated to a symphony of chirping from the trees above us. Our backyard is filled with their little brown shell casings; stuck to the tree bark, the fence, the table. I guess I've had them on my mind a bit lately and curiosity led me to do a random search for "cicada" on Etsy. Apparently I'm not the only one with a bit of fascination for the creatures! Long story short, that is how I happened upon the jewelry of Carrie Bilbo. I'm sure I've said it here before, but I'm not much of a jewelry wearer. I've had the same little hoop earrings in for... ten years now? Every once in a while I'll throw on a simple necklace, but that's about it. But, Carrie's jewelry really struck a chord with me. 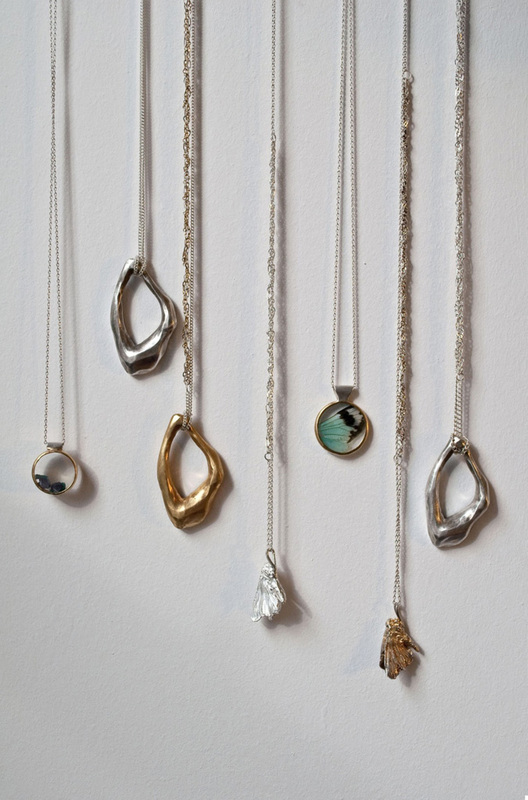 I love its simplicity and the organic feel of each piece. 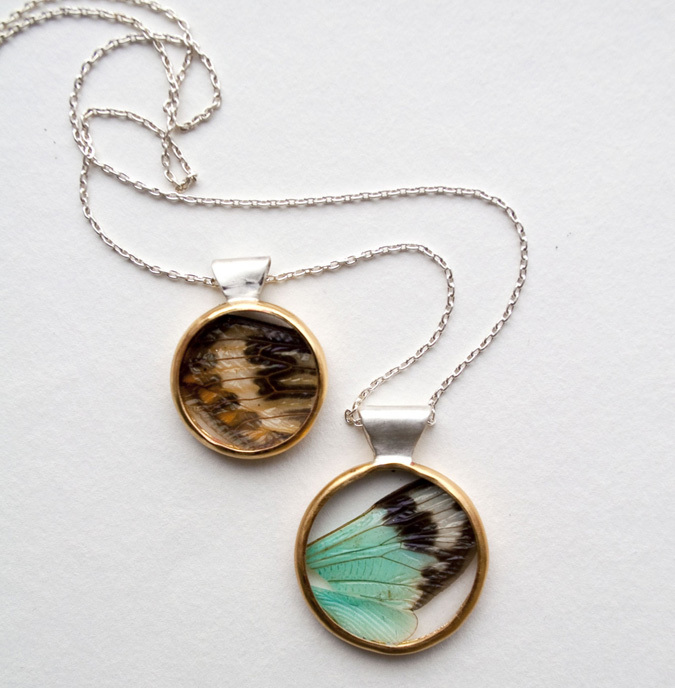 Mostly I'm in love with that cicada wing necklace! Oooohh! I think this is my favorite fall collection so far. The two looks above are definitely on my "recreate" list. 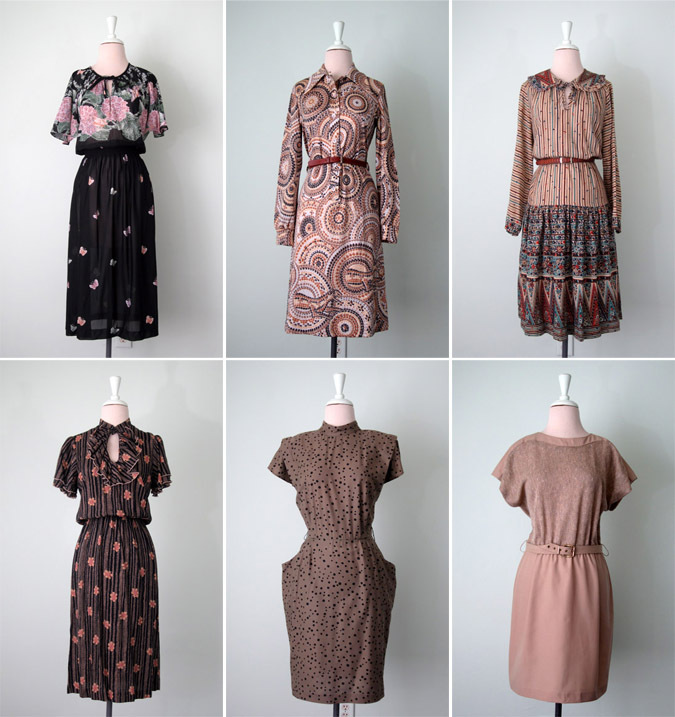 Of all the collections I drool over, Dear Creatures is the most attainable, so it's exciting to see so many pieces I love. Here's a sneak peek at the items I'll be adding to the Etsy shop this afternoon. Thanks so much for stoppin' by! It's that time of year, whether you're ready for it or not. 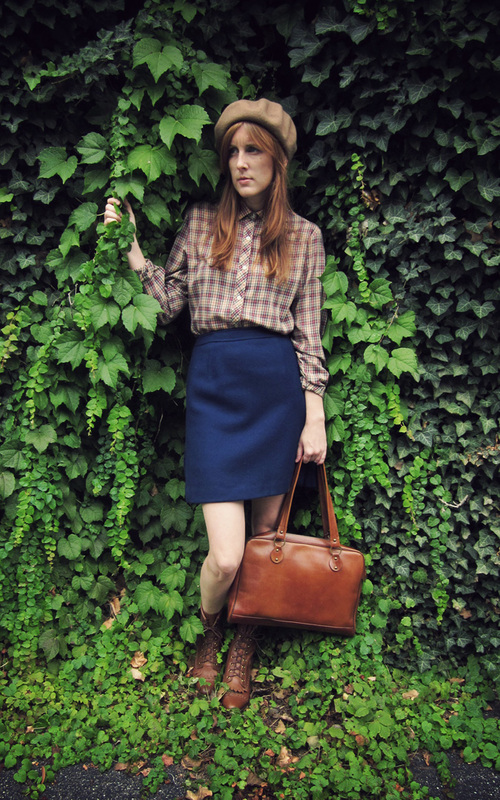 Fall collections are beginning to debut left and right. While I'm still quite content with the hot weather and wearing sundresses and sandals, I'm curious to see all the fall lookbooks. 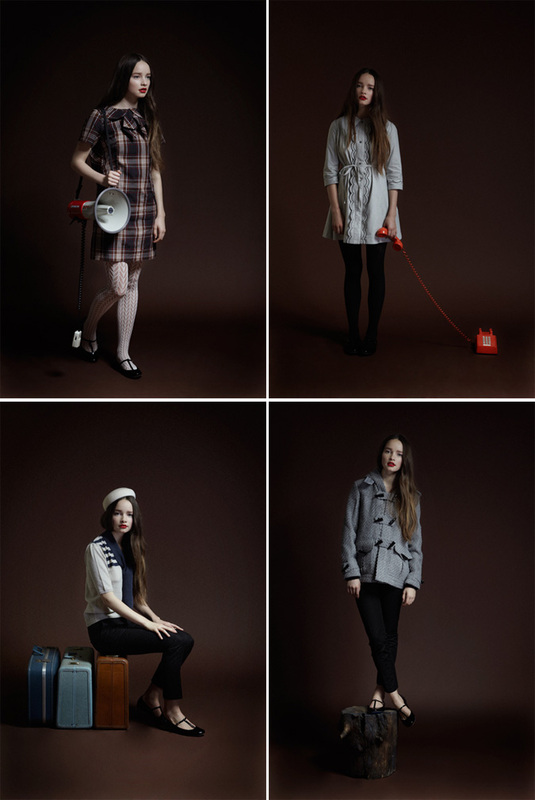 I really like the new APC collection, though some of the looks don't exactly scream fall to me. I guess it's the bare legs that are giving that effect (does it freak anyone else out how much they airbrush the model's knees?). That first outfit looks downright summery, but pair that dress with tights and a cardigan and you'd have a cute fall look. I also like the bright splash of yellow paired with brown and the velvet shorts. Also, I just picked up a light camel colored 70s jumper and was debating on whether or not to shorten it for myself. This collection just convinced me to go for it! 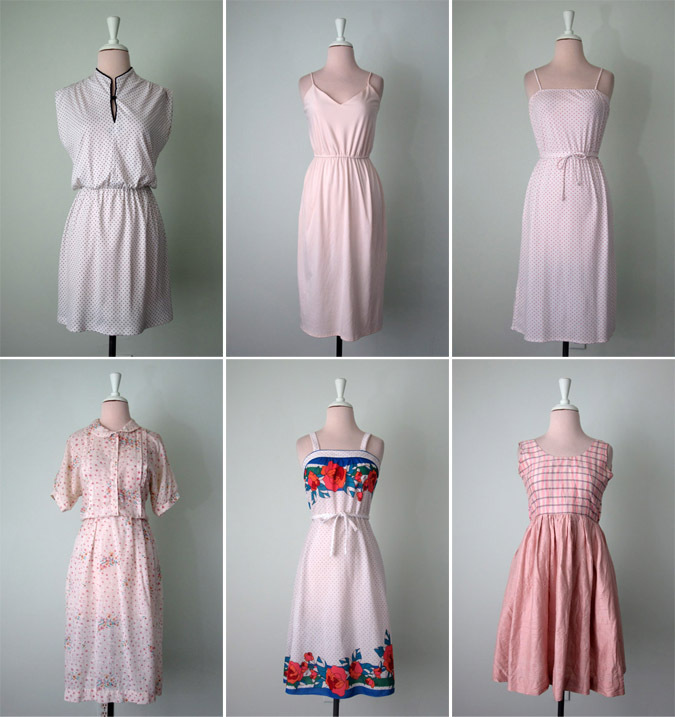 Here's a new batch of dresses from Smilin' Gal! They're in the shop right now. Be sure to check 'em out and thanks as always for stopping by! - listening to: The Cure - Kiss Me Kiss Me Kiss Me "Just Like Heaven"
Today was one of those days when it couldn't decide if it wanted to be hot or chilly, sunny or rainy. That was fine with me since it gave me a chance to try out my new cardigan. I have to admit it's pretty much the softest sweater a gal could ask for and it was just the right weight for the day. I'm quite sure this little 90s dress will end up in the shop this week (probably in Thursday's update). I like it, but I always feel a bit strange wearing 90s pieces and it's too cute to sit in the back of my closet. In other news, we got our patio furniture today and had our first outdoor lunch... Chef Boyaredee pizza and homemade pickles! Obviously nothing fancy, it was nice to sit outside and enjoy our lunch.